Braeakfast was very expensive. But Quality was Good. It's so far from Center of City. But the Train is covered that. If I visit there for work, more good at that time. not a travel. Amenities were replenished every day, place was kept nice and clean and the hotel is close to many train stations. The staff was great and the shower pressure and heated toilet was amazing. The location was very convenient for shopping, dining, sightseeing and night life. The restaurant’s foods are good. Not so great, but fulfilled my needs of getting greens and carbs. Lemon-taste Wiener surprises me, I thought it would be ordinary wiener. It is good. The restaurant manager are kind, the bar lady were kind too. They gave me a yakiniku even tough I didn’t ordered one. The hotel’s cleaning service are good too, if you cooperate with their Green Concept. Keep it up. APA Hotel Osaka Higobashi Ekimae This rating is a reflection of how the property compares to the industry standard when it comes to price, facilities and services available. It's based on a self-evaluation by the property. Use this rating to help choose your stay! 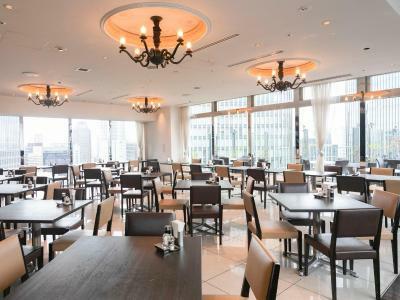 One of our top picks in Osaka.Conveniently located in Osaka's business district, APA Hotel Osaka Higobashi Ekimae is connected to Higobashi Station by an underground pathway. It offers free WiFi in the entire property and features 2 restaurants, a 7-minute train ride from Osaka Station. Guests can relax at the public bath on site. The hotel is 9 minutes by train from Umeda Station. Nearby tourist attractions include Osaka Castle and Dotonbori shopping street, both located within a 10-minute train ride of APA Osaka Higobashi Ekimae Hotel. Kitashinchi Station's West Exit is a 10-minute stroll from the hotel. All rooms come with an private bathroom equipped with a hairdryer. They feature facilities such as a 40-inch LCD TV and fridge. Guests will find slippers and bath amenities including a toothbrush set. An original mattress optimizing weight distribution is available in all rooms for guests to enjoy a comfortable night's sleep. Guests can enjoy a spread of local and Western specialties at La Veranda Restaurant or French and Vietnamese cuisine at Chao Sai Gon. Both restaurants serve a Japanese and Western-style breakfast buffet. Osaka Higobashi Ekimae Hotel also provides vending machines and a currency exchange machine on site. Guests can purchase beverages from the drinks vending machine on site. When would you like to stay at APA Hotel Osaka Higobashi Ekimae? Rooms come with an private bathroom equipped with a hairdryer. Rooms feature facilities such as a 40-inch LCD TV and fridge. Guests will find hairdryers, slippers and bath amenities including a toothbrush set. Fitted with 1 single bed (47 in wide). Features a 47 in wide bed. This triple room has a soundproofing, electric kettle and air conditioning. Area Info – This neighborhood is a great choice for travelers interested in friendly locals, city walks and local food – Check location Great location - show map Guests loved walking around the neighborhood! House Rules APA Hotel Osaka Higobashi Ekimae takes special requests – add in the next step! APA Hotel Osaka Higobashi Ekimae accepts these cards and reserves the right to temporarily hold an amount prior to arrival. The property can provide prayer rugs and compasses for Muslim guests. Please contact the front desk at time of check-in. Please inform APA Hotel Osaka Higobashi Ekimae of your expected arrival time in advance. You can use the Special Requests box when booking, or contact the property directly using the contact details in your confirmation. The bedroom lack space. It was just impossible for my husband and I to move around the room. Though the room was classed as double it would be more suited for a single person with just a cabin suitcase. The lack of space in the bedroom made it very inconvenient for my husband and I. I travelled a lot and have never seen a hotel room with such a narrow space between the bed and the dressing table. Well decorated and modern hotel very close to a metro station. The rooftop restaurant is awesome with beautiful views. My family and I enjoyed the very long Happy Hour at the bar. Our room was wedged between buildings and we had no view. Couldn't figure out the AC or if it even worked and the room got very hot easily. Breakfast was cold. Partner had tattoos so he wasn't allowed in the onsen. Part of the APA chain so the right wing propaganda manuals are in this hotel just like the one we stayed in in Tokyo. Wide variety of breakfast options from Japanese and Western cuisines. Metro station right out front and 7/11 across the street. Walking distance to Osaka Station. Staff were friendly and helpful. Near Higobashi station, 7-11, Some restaurant, 10 minute from Umeda by walk. Great location for a number of the train lines. One of the station exit is at the entrance to hotel while 2 different lines are a short walk away. The onsen was great, clean and open late. The staff were very helpful. Laundry available in the women’s changing room of the onsen. Quick checkin and out. Only a short taxi ride away of a night time to the areas we went out only costing 1000 to get back as the trains stop around midnight. Our room was small. I would appreciate more storaghe space as shelfs or similar. Metro station in front of hotel. Close to main station. Nice hotel room, wifi free. Nice breakfast in 2nd floor and nice view from second breakfast roon from 12th floor. First room proposed was just next to a very noisy ice machine, but room was gently changed to a floor with no vending or ice machines by the friendly staf. Metro station litteraly at the hotel tower foot as well as a small restaurant/bar for early cheap breakfast or late beers. Not too many places to choose from for meals as this is a business area. The train system takes some getting used too, just remember which exit you need to use at your station! The bathrooms are small but functional. Eating at the hotel is expensive. There is no milk in the fridges in the rooms for tea and coffee. Everything apart from the subway being outside. I have never stayed anywhere so small, the room couldn’t barley fit our luggage and us in with it. The bathroom is so small. It’s uncomfortablely hot. Stay away!! !